Over the holidays, my mom and great aunt went to a fancy cheese shop in the city and there was a promotion where you got a tub of ricotta with your order. Well, it turns out that they bought so much cheese that they came home with FIVE tubs of ricotta. 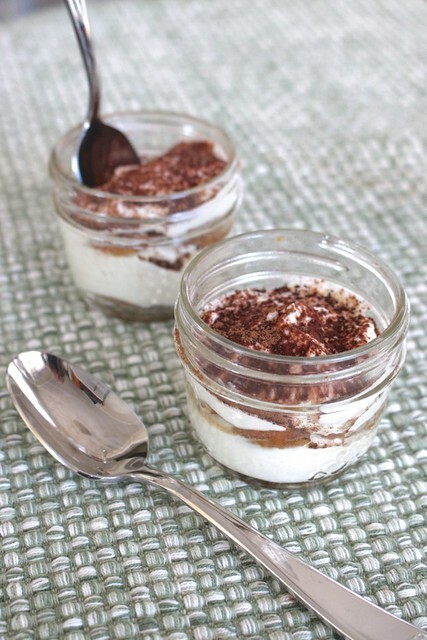 There is only so much lasagna you can make, so my mom passed some onto me and I decided to play around with making an updated tiramisu recipe. I did a test run of it at our New Years Eve cocktail party and it turned out really good. 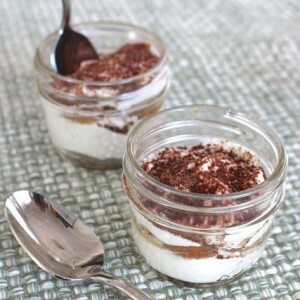 The ricotta has all the great texture and taste of mascarpone cheese, but with a lower fat content. Instead of sugar in this recipe, I used Truvia Baking Blend. I’ve been using it more often lately for quick breads, muffins and cookies, to help reduce how much sugar we eat. 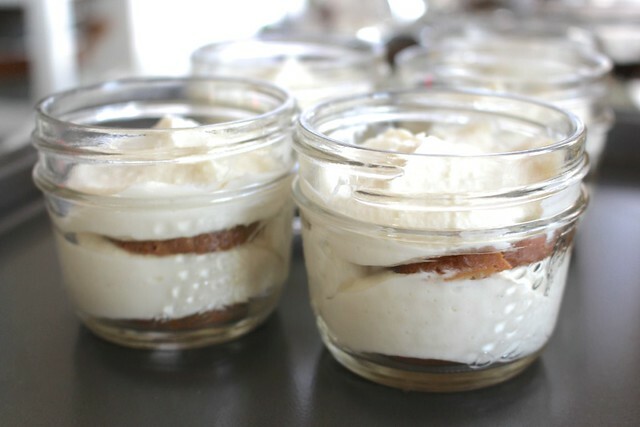 I portioned out the servings into mini 4 oz mason jars I had from when I made Individual Mini Mason Jar Apple Crisps but you could also easily double or quadruple this recipe to use a glass casserole dish or to fill more jars. In a stand mixer, blend together ricotta, cream cheese, sugar (or Truvia Baking Blend) and 1 tsp of the coffee for 2-3 minutes. 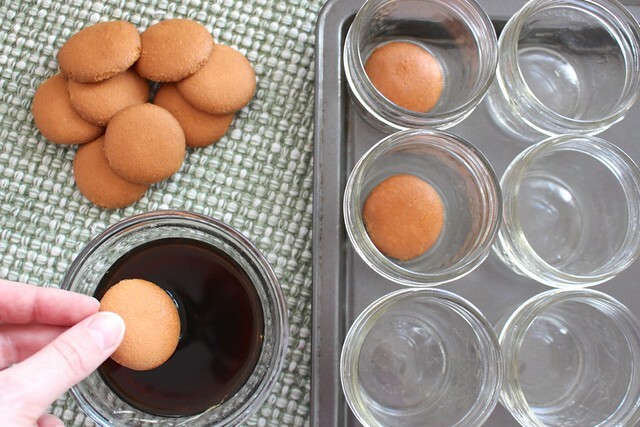 Meanwhile, soak cookies for 1-2 sec in remaining coffee, and place one in the bottom of each jar. 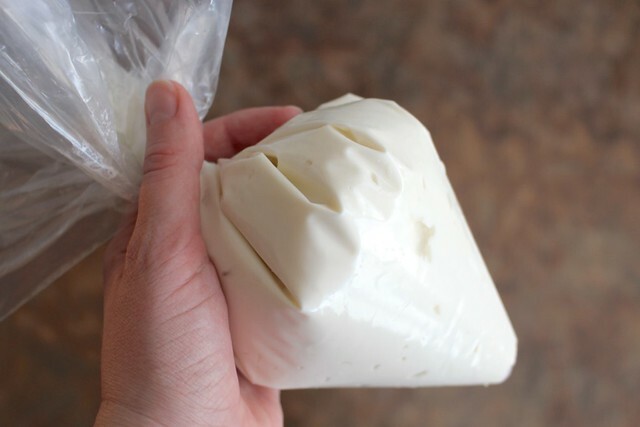 Scoop ricotta mixture into a large freezer bag, cut off the corner and use as a piping bag. Pipe a layer of the ricotta mixture into each jar. Top with another layer of soaked cookies. Break up a few into smaller pieces to fill the area. 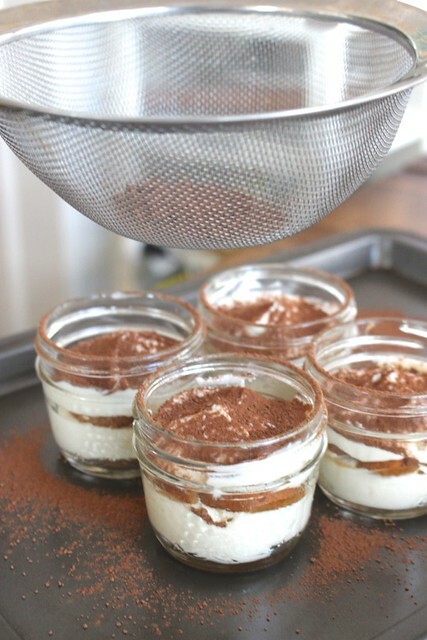 Add a final layer of the ricotta mixture and use a small spatula or spoon to smooth the tops. Chill in fridge 2 hours or ideally overnight. Dust with cocoa before serving. Store in the fridge with the lids on for up to five days. 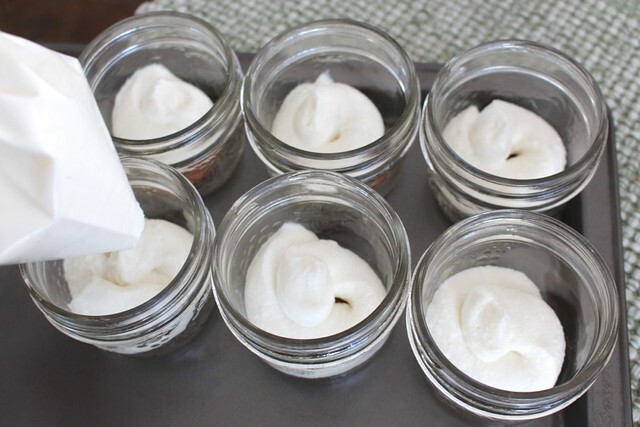 Makes 6 servings in 4oz mason jars. 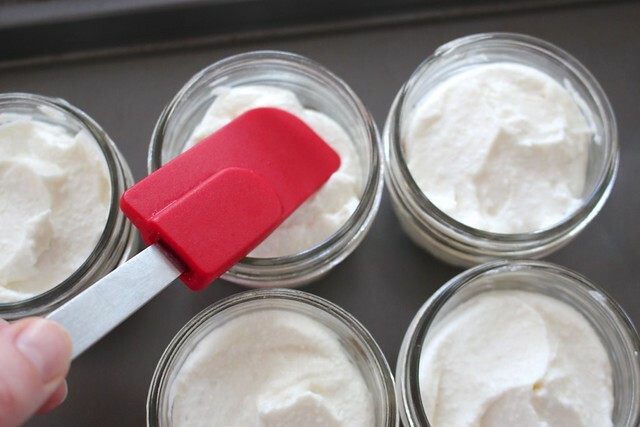 This recipe can be easily duplicated for more jar, or to fit in a pan. 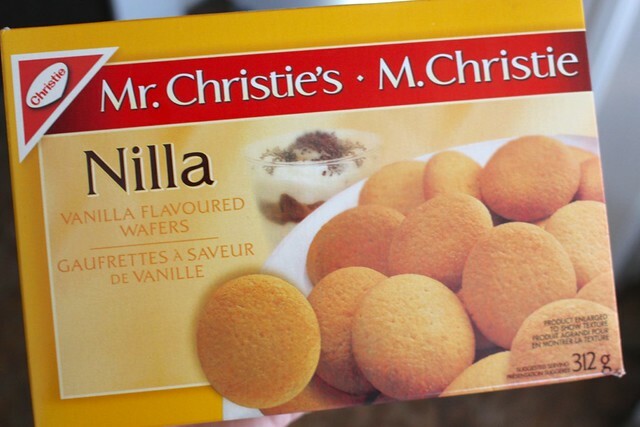 I always have a hard time finding ladyfingers that are peanut and nut free, so I used Nilla vanilla wafers instead, and I find that they taste even better with their mild vanilla flavour. 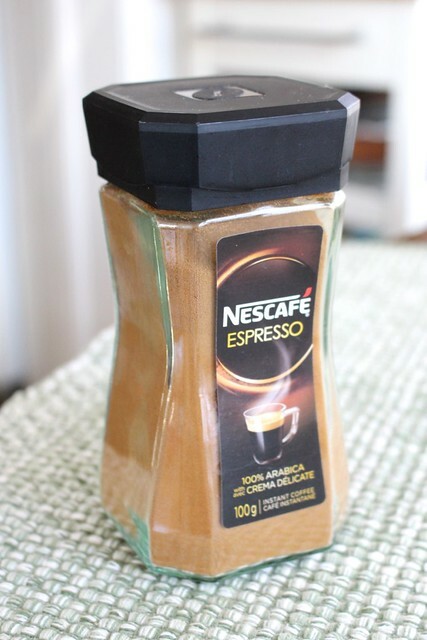 I don’t drink coffee, but I keep this espresso powder on hand for when I need it for recipes, whether I use it made into a cup of coffee like in this recipe or as a powder in brownies. 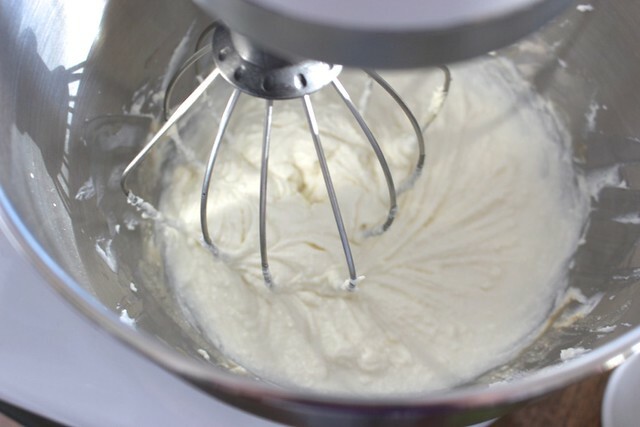 Scoop ricotta mixture into a large freezer bag, cut off the corner and use as a piping bag. Pipe a layer of the ricotta mixture into each jar. Top with another layer of soaked cookies. Break up a few into smaller pieces to fill the area. 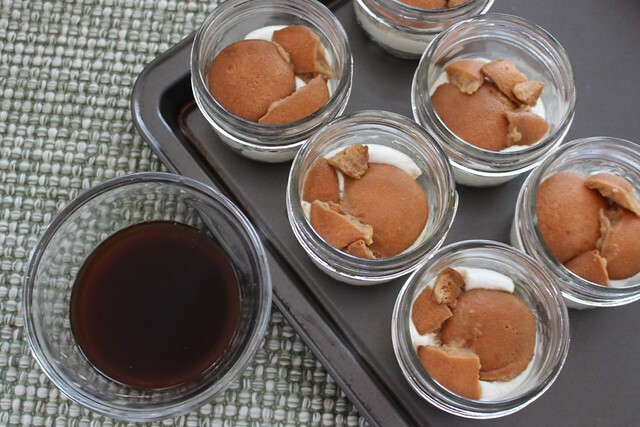 Add a final layer of the ricotta mixture and use a small spatula or spoon to smooth the tops. Chill in fridge 2 hours or ideally overnight. 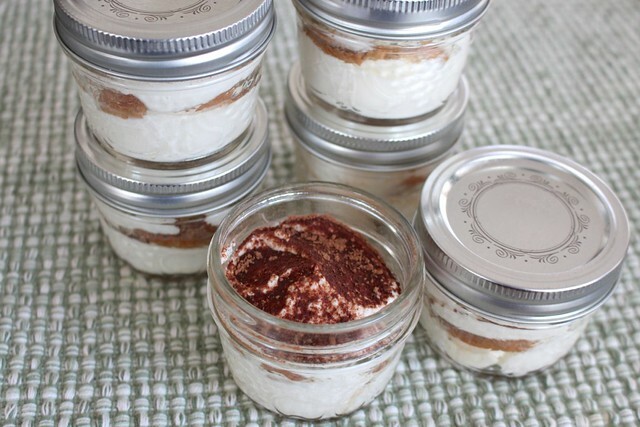 You can store them in the fridge with the lids on for up to five days (but there is no way they will last that long). The jars make it easy to take them with you on a picnic or to a potluck, or even in your lunch bag (which I may or may not have done today). They’re a simple dessert, but boy do they taste good!